LEGO has published around 130 instruction manuals today for some of the new 2016 sets. You can take a look at them here. 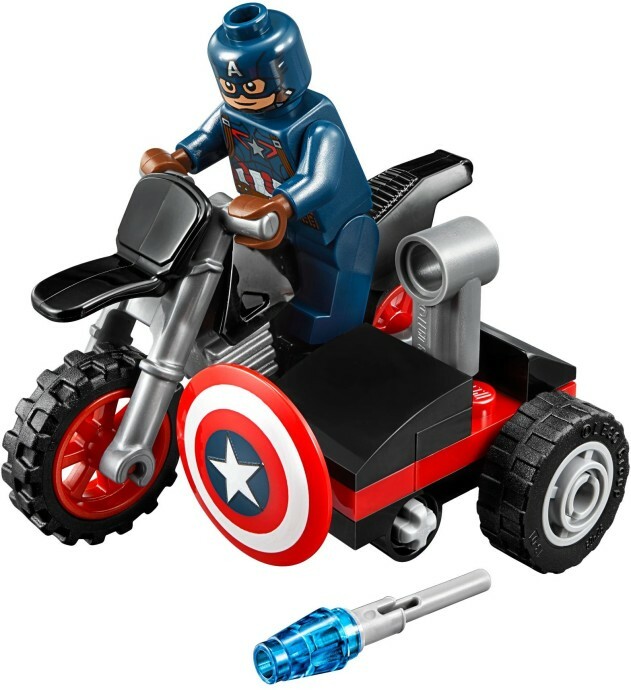 This includes the instructions for 30447 Captain America's Motorcycle, a polybag that we didn't have an image for. I hope I can get this at Target for cheap, it's really nice. Well, that looks OK, minus the ridiculous sidecar which can't seat a person. I wonder if it'll be a TRU item like the Hulk and buggy. Nice! I hope I can find it. All I see is good! Captain America in a cheap Polybag set. A motorcycle in a cheap Polybag set. It ain't pretty, but there is some good stuff in here! ^Agreed CaptRogers...Good stuff cheap and great for the little ones. They get a nice fig. with shield, motorcycle and a weapon play feature...good small gift. I'm gonna' rearrange and simply mod the side car to seat a fig. Or a rack to hold Caps. equipment from other sets: his space jet pack, breather and flippers, shield of course, etc. Pretty awesome for people that don't have a Cap fig yet ! Yeah I don't get the hate. Remove stupid flick missile and the side car is fine, and is fixed to the bike like all of them have been. $4 (hopefully) for Captain America, a motorcycle, side car, and shield? I'll take it. It looks like something you could of got with a G.I. Joe toy. The motorcycle alone is worth a couple bucks. I'll pick up a few of these as long as they're not $9.99. @Matt89190: The sidecar is fixed on with two Technic pieces. Neat, but who will be selling it? hope its availible in the u.k even just for the minifigure i,d buy it..
@Matt89190 http://cache.lego.com/media/bricks/5/2/4563044.jpg it's fixed and should have no more wobble than any other lego side car. You could always down load the instructions and see for yourself. One of the best polybags in ages IMO. I don't understand the hate either. It's a polybag, not a full fledged set. It's a great set for a polybag and everything I would expect from one. With the Civil War movie likely to be popular, and increase the desire for a recent Captain America figure, this is great. People are expecting too much from what is meant to be a small thing. Can anyone tell if this Minifig is the same as any Captains coming in the new sets? Never mind... just realized it is. I think I will pass this one. The way the sidecar is build, looks like the one from the New '66 Batcave... except that it has a cannon instead of the room for Bucky!!! Yeah not really a collector's set since its the same Capitan... Had it included an exclusive Vision or Hawkeye; or dare I say Spiderman, people would have gone crazy for it. Already have this Cap, and the bike looks really stupid. I'll pass. Really thought Lego would do something awesome like make the Stealth Suit Captain from Winter Soldier for this. So disappointed again by Lego. Pirate Batman, the lame no name no one cares Force Awakens Thug and this. Insane that we had the Silver Centurion Iron Man (just amazing) with Lego Avengers game and the quality drops so far so fast for everything announced after. Imagine walking into the Harley Davidson shop and asking for a missile launcher! I stand by my statement that people are expecting way too much out of these polybags. Just appreciate it for what it is and move on. @monkyby87 I agree, what do people really expect for what will likely be a 5.99 USD poly? You get a Captain America fig and shield with a motorcycle.. seems like it is worth 5.99 USD to me. Now, if it is more than that then I would say it is too pricey, but a neat set for someone who may want a Captain America but does not want to pay for a set with him it it.